This was my first anime convention and a risk for me. On one hand, I figured I’d try it since there’s a demographic overlap between Faery Ink Press and anime in general. Also, the Sparkstone covers are vaguely anime–another advantage. On the other hand, I know very little about anime culture and I was afraid someone would pop out of nowhere to quiz me. Fortunately, that did not happen–and nor did it matter! While the majority of the attendees were cosplaying as anime characters, many others were dressed up in Harry Potter costumes or wearing buttons with other non-anime fandoms. Overall, it was a very welcoming atmosphere and my fears about “belonging” were put to rest. Especially when the sales started rolling in. 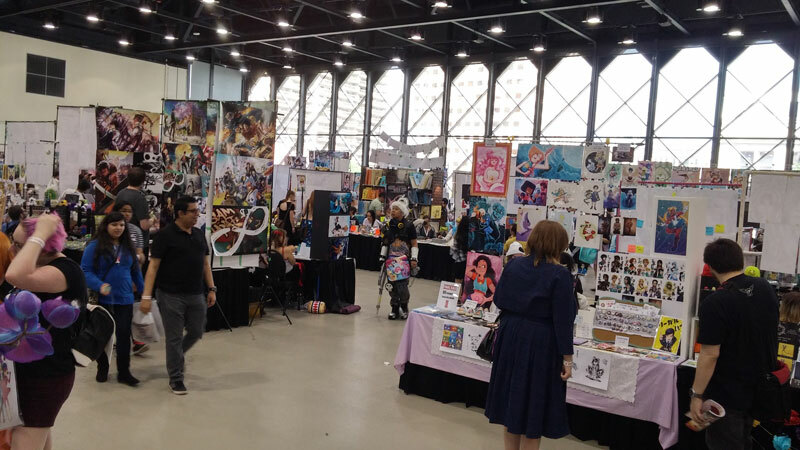 The convention was well organized; volunteers wandered the floor regularly, and there was even a dedicated person who checked in with each artist every few hours to ensure we were fine, in case we needed a bathroom break, etc. On Sunday, there was even a food delivery service! I got mochi. Tasty, tasty, mochi. I was in a pretty good location, in a row just off one of the entrances. Unfortunately, I was right under the air conditioning. This is one of those things that can’t be changed. Someone had to be stuck getting blasted all weekend, and this time it was me. You just have to roll with it. I get cold easily, which doesn’t help either. What really sucked was my sign kept blowing forward: I had to tape it down so it wouldn’t knock over my display. And this is my GOOD banner too! Remember in the Ottawa post I was talking about the branded display that my sister and I were working on? This was its inaugural convention! It is a three-box set, Russian-doll style (the boxes fit inside each other), painted white with a purple lid. The lid has plastic panes that can fit two irregularly sized pieces of paper, and can sit on its side as a display piece itself. I had a couple of fellow vendors compliment the box display. A good display set is like good typography: it serves up the content while not being distracting to the content its displaying. I think people appreciated the bookshelves as it allowed them to easily browse what I had. I think it will take a couple of shows before I perfect the use of the boxes. Ideally, I need lights inside the box. The box is deep enough that it casts a shadow on the interior contents. I also would like a second set to even out the table. The boxes stacked on top of each other also creates a blind spot for me: I’m happy to have people browse the shelves, pick up books, read the backs, but I can’t see if they’re returning the books to their rightful spots. This means I’ll have to do more clean-up and straightening. 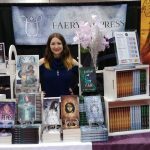 I had an ambitious sales goal for this convention – and I exceeded it! Nearly 60% of people used a card to pay, and about 40% of those people opted to throw the purchase on debit. No issues with Moneris, and because of the shorter convention hours, I wasn’t worried about keeping it charged for the whole day. Friday was surprisingly good for me. Even though the traffic was slow, I managed to meet and exceed my daily target. It was a slog, though–long periods of few people walking by, and when you start seeing the same people walk by three or four times, that’s when you know there might not be much else going on. Saturday will be better, everyone says. But Canada 150 celebrations could tip things either way. Either it would be extremely busy, or slow. It was slow. I did maybe 60-70% of what I did on Friday. I went home feeling unoptimistic. I’d already made a profit by this point, of course, but it was the first time I’d felt relatively unstimulated. Usually I am buzzing with ideas about how to improve my performance at this point. Instead, I felt more like I was going to a grueling 9-5 job each day. Sunday was a major improvement. Not sure why, but it seemed like everyone decided to come on Sunday. From 11am-1:30pm, I was selling consistently. This is more of what I’m used to. The interactions make the time go faster, and it was one $30-$40 sale after another. After 2:30pm, the sales halted as people left, though I still got some enthusiastic interest. 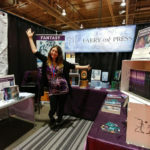 For most of the convention, The Violet Fox Series was the strongest seller. On Sunday, the brisk sales changed up the dynamic and the Sparkstone Saga caught up. 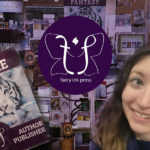 Stars In Her Eyes sold slightly more than The Violet Fox, but as a series The Violet Fox sold far more than the Sparkstone Saga bundle. The $35 price point continues to be the most appealing. I like the $45 price for all three Sparkstone Saga books, and people in general seemed to think that getting three books for that price was a good deal (especially considering Hunger In Her Bones’ size!). As I add on to each series and approach ten books, I may start evening out the book prices and doing simpler deals. This will also play into my longer-term, customer onboarding goals. I’m still selling the eBook bundle for $21 – I think I can afford to knock a dollar or two off that as an experiment to see if that converts better. On the plus side, I’m seeing slightly more sales of individual eBooks. This may increase as I have more selection. Speaking of selection, I sold out of Within – I only brought three copies. This will be the last time I have it on the table, at least for a little while. It’s getting harder to justify its place in the brand and the table itself, even though it quietly and consistently sells. I’d rather focus on my two series until I have another horror book to promote. People who bought it did not tend to buy my other books and there’s nothing worse than splitting your brand. I’ll still have it in eBook form and in the eBook bundle. I also sold quite a few buttons. To be honest, I can’t wait to get them off the table. While they attract button lovers, they don’t really attract readers, and they take up a lot of space. Their optimal position for best sales is annoyingly at the front of the table. I may drop their price again just to move them faster. They were a good experiment, but I’m ready to try something else, and like I said above–diluting your brand is no good. 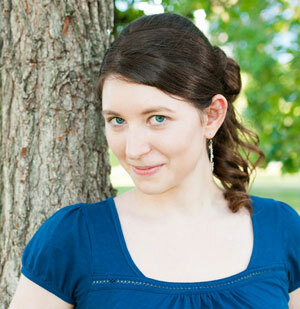 Instead of the parents, I was face-to-face with my audience–teen girls. Usually I’m selling to their parents at other conventions, as they’re too shy to speak to me directly. I got that this time too. Young girls don’t have dollars. They’re enthusiastic, often confident, and many are aspiring writers themselves…but they have a budget. And of course, many of them don’t have credit or debit cards. The cash they have is precious! So I chat with them and give them my card, hoping later they will return. –“I don’t like the product; I am just interacting with you because you said hello to me.” Usually indiciated by shy, one-word responses in initial conversation. I don’t push these people. 100% of the time, if shy people like the product, you need to leave them be so they can make their purchase decisions. I don’t waste time convincing people outside my potential audience to buy. There are many fish in the sea. –“I like the product, but I am not convinced that I should buy it from you right now.” This is a classic case of not enough social proof. Someone meets you for the first time and sees your product – why should they buy from you? Some people need more from you to get to a place where they are comfortable with the purchase. Whether that’s more conversation, bigger discount, more time—it’s different for every person. –“Stop selling to me, you are too aggressive.” Probably the most defensive of the meanings. By bringing up money first, they are attempting to take control of the conversation. The thing is, they were always in control of the conversation: I am in control of their attention and focus. I direct them to my cards, and reinforce that they have all my book information on them if they care to take one for the future. Sometimes, however, if they continue to browse, I take the opportunity to make conversation. At the very least, it makes the time go faster. At most, an interested browser attracts another and another. –“I don’t have any cash on me.” This is where I reinforce that I take credit and debit cards. In all meanings, “I don’t have money” is a closing statement and needs to be treated with respect. If you’re selling, you either have to figure out how to quickly resolve the conversation in your favour (by giving the customer a business card) or finding the truth behind the statement (getting them to return later when they do have money). I had a couple of strange interactions this weekend, but this one was the funniest. Me and my naïve mind thought, Oh, he likes action-adventure stuff, in the style of that Triple-X movie starring Vin Diesel. I laughed and said, no, this is not exactly like that. He smiled and waved goodbye, telling me that if I decided to write his favourite genre, to let him know. It was only after he left that I realized he meant X-rated. Otafest runs on a lottery system with its vendors. I’ll apply, but there’s no guarantee I’ll get in next year. I think adding more local anime conventions to the docket would be a smart move for me. Otafest is also over the May-long weekend in 2018 and not during the Canada Day weekend – I’m unsure if this is an improvement. My next appearance will be at the Banff Farmers Market. Yes, you read that right! Every Wednesday in August, all day. See you there?